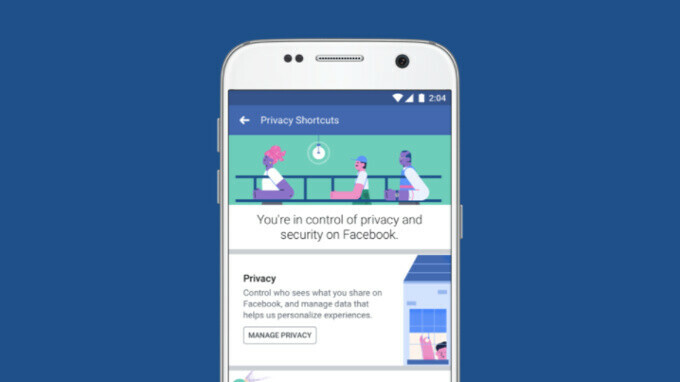 Today, Facebook has rolled out a change that will make people find and adjust their privacy settings much easier. The change comes amidst increased understanding of how poorly Facebook handles users' data and particularly how it made it possible for third-party developers to get access to millions of users data. British-based Cambridge Analytica, closely tied with Stephen Bannon, former White House Chief Strategist under Donald Trump, had obtained access to the personal data of not just thousands of users who participated in Facebook polls, but also all of their friends' personal information. This information could have been used in all sorts of ways, including malicious ones and vote rigging. Facebook's own Mark Zuckerberg reacted with an official words of apology, but those words had a hollow ring to them as the privacy breach had been reported months in advance and the company did not do anything about it before the public outcry. Well, better late than never. These latest steps bring the privacy settings front and center in the settings. Before the change, Facebook's menu was overly cluttered and finding the right privacy setting was quite a challenging task, especially for the user that is not particularly tech savvy. The new settings give easy shortcuts to functions such as two-factor authentication, user control over what is shared, the option to manage who can see posts, and the option to learn more about ad preferences. Another welcome change is a page called “Access Your Information,” where users can see publicly shared information and delete posts on their timeline or profile that they don't want on Facebook. Again, all these features are not new, but they have been hidden in menus, so that most people probably did not even know of their existence. How about Facebook makes it possible that no one can see what you like or comment or respond to like back in the old days of privacy.. They could do that too, but right now they want to protect your Data now. That really isn't privacy as it's shared with friends and not with the public. That's true but I cannot stand that people can see all of my activity.. that's why I stopped using Facebook besides also them exposing my privacy to third party.